We have a range of government financial assistance to help subsidise your course fees. Please click on the relevant links below to find out more with how we can get you closer to achieving your learning and career goals. You may research the most relevant funding to you through the links below or in the menu on the right. 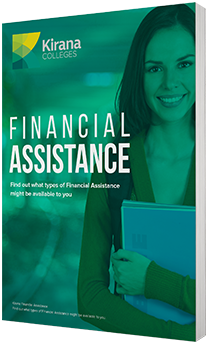 If you would like assistance and guidance from Kirana Colleges our 2-step government financial assistance query form below will put you in touch with one of our Course and Careers Advisors who can tell you about what you may qualify for. Further your career and build a better future with our Skilled Capital funded courses. Skilled Capital is an ACT Government initiative providing a limited number of funded spots for individuals wanting to undertake a nationally recognised qualification to improve on their employment outcomes. Students who successfully complete a course through the Skilled Capital program are eligible for a completion bonus – read further for more details. To find out what qualifications Kirana Colleges is able to deliver to eligible students visit the Skilled Capital funding page. It’s time to build your career with our Higher Level Skills courses, funded by the Queensland State Government. To find out what funded qualifications Kirana Colleges is delivering to eligible students at our Chermside and Browns Plains campuses visit the Higher Level Skills funding page. GROW with our Certificate 3 Guarantee courses, funded by the Queensland State Government. The Queensland Government wants more Queenslanders to undertake training in areas where skilled workers are needed and we are one of the select providers to help make this happen. Kirana Colleges is now delivering eligible students funded qualifications through our Chermside and Browns Plains campuses. Visit the Queensland Certificate 3 Guarantee page to learn more. As the WA economy continues to grow and diversify, the demand for qualified workers also continues to grow. Jobs and Skills WA is a government initiative focused on providing guaranteed funded training for positions that are or will be in high demand in WA. To learn what qualifications Kirana is delivering to eligible students at our multiple locations in WA visit the Jobs and Skills WA Funding page.